After announcing on a whim in class that my favorite cryptid is the Leviathan i have decided to make this my research project for the quarter. I have read of, heard of, and seen many allusions theories and references in popular media to the Leviathan. The Leviathan is described in detail in the Old Testament of the Bible. Because of so many small references to this creature I want to dig deeper and determine what else I can find. I don't quite know what information is out there but i will begin searching in depth this week. I am super excited for this class and the opportunity to study a creature of my choosing. I think this will be a super exciting experience this quarter. I announced during our introduction session last Wednesday that my favorite monster was Sasquatch. I still feel the same way, but am uncertain if that will be the focal point of my research. I think the majority of the class may be focusing their respective research on the more popular or well known monsters, which may decrease the availability of local resources. Considering all of my options will be paramount and I will take the remainder of the weekend to continue researching other options and the availability of resource material. I am looking forward to starting this project and think the ability to identify the varying options students and others have to conduct empirical evidence is important to my future career aspirations. Furthermore, the different research avenues will enhance my ability in the field of education and assist me with raising my young children. At first I thought choosing a cryptid would be easy, but like many of the other posters, after browsing through the extensive wikipedia list, I found that it wasn't so easy. A couple people suggested that I research the Illiamna Lake Monster, which is a local myth from the area that I'm from in Alaska. This is more of a local legend and I didn't think there would be a lot of literature about it, so I decided against it. Like a couple other people, I thought that the chupacabra might be interesting to research, but I decided against that too since there are already a few other people interested in it. I have finally decided that I'm going to research merpeople. I'm choosing merpeople because sea creatures fascinate me. I think that I will be able to find quite a bit of literature about them and I'm interested in learning more of the myths/legends/stories about them. Originally, I thought it would be interesting to do a monster that was located in Washington. The one that intrigued me most was Batsquatch. From what I have seen in my limited research was Batsquatch is a giant purple bat who lives near Mount St. Helen's. Just about every website that I have seen has given the same description, "great winged bat with purple skin, and bashing red eyes." I wanted to do something close to Washington, because prior to class on Wednesday, I didn't know that there was any cryptids in the area. The other idea that I has was to research a Yetti. I wanted to do this, because while I was in Peru last summer hiking up the Andes, my group and I were joking about seeing a Yetti. Through my initial research, there is a lot more information about the Yetti than Batsquach. I don't know which one I will choose yet. I am going to give it a little more time to decide, but those are my ideas. So unlike most everyone who's posted already I think I'm going to be a little less adventurous. Within Popular Culture, especially Young Adult Literature, vampires have become a huge fixture and don't seem to be going anywhere any time soon. However, many of their depictions nowadays have departed from the original myths surrounding the vampire. I think what I want to do is research the basis for the myth and see how it could lead to how they are depicted in today's literature and other forms of popular media. One of the creatures I did stumbled upon was the Chupacabra. Like another blogger already wrote, it is translated into "goat sucker" and has been spotted in North and South America. In the little that I read about the Chupacabra, it was interesting for me to learn about the different sightings and incidences that people had with it. In one case, the women was describing a creature that she had recently seen in the film Species. In this way, the Chupacabra has had many different descriptions about its appearance. Another cryptid that I have looked into is the Spring Heeled Jack. I was unsure about his cryptid status, but he was on the list on Wikipedia soooooo he may be acceptable. 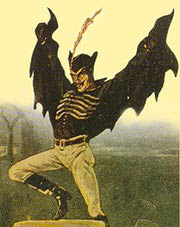 Sprinheeled jack is described as a demon that appeared in the Victorian Era and all over Europe. He has abilities to jump extremely high and has been described with fiery eyes and clawed hands, yet with the figure of a man wearing a trench coat. While there is skepticism about this creature and that his presence was just caused by a hysteria about the bogeyman, others believe he was summoned by an occult. This cryptid, if he is one, is very interesting to me and may be a winner for my paper. The Mothman is another cryptid that stuck out to me. I don't know if it was because of the movie, but this 'thing' seemed to have a lot of history behind it. I also liked it because the little town where it was first sighted, has now become famous for its supposed presence. While there is a lot of information about the Mothman, I feel that this one may be too well known. So it seems that I am still stuck on deciding what to write about. I will look into my choices more thoroughly and try to dwindle it down to one. Overall, it has been fun and interesting reading about the history, stories, and sightings of these various creatures! 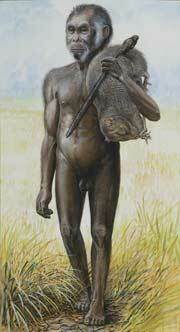 I am considering looking into the correlation between the diminutive fossils of Homo floresiensis (aka., "The Hobbit") and the tales of the Ebu Gogo, small hairy creatures that were rumored to have been exterminated because they would steal the food and children of the people who now inhabit the Indonesian island of Flores. The fossils found on Flores are unusual due to the small stature of the adult individuals as well as the general agreement amongst anthropologists that they did not evolve from Homo sapiens, but perhaps Homo erectus. This gives credence to the concept that other species have overlapped in their habitation with Homo sapiens until ultimately our species have out-competed them, destroyed them or perhaps forced them into hiding. I'm not exactly clear on what cryptids I can choose from. I'm not particularly drawn to sea creatures, although the Kraken has always fascinated me. I'd love to learn if there are any internal parasitic cryptids. Although, I'm also interested in the notion of a man-eating plant. I have seen the bloom of a corpse flower, therefore it seems plausible the the pitcher plant could have a mega-relative able to digest something the size of a human. Having said all that, I will likely choose to explore the tales of the Ebu Gogo as they relate to an evolutionary perspective. I'm looking forward to the experiences that we will have in this course and the knowledge that I will gain from other students. This is my first time using Blogger. I anticipate great personal growth in ability to utilize such media as we progress through the quarter. Deciding on a monster/cryptid to research is a little bit hard for me because I do not know much about them in general. However, I really want to do Nessie because of my Scottish heritage and I want to know more information about her. Another monster I had in mind is the Phantom Cat. They are very large cats, like jaguars, that roam around and are also called Alien Big Cats. Supposedly they are seen as extraterrestrial, since they have been sighted when there was a UFO sighting. Some people link them to cattle mutilations, cars not working properly and many other strange occurrences. Although, I am not finding much information on this monster at this time, but more research might lead to new information. Also, I’m really just fascinated in general by lake monsters. There is a lake monster in Lake Okanagan, near Kelowna, BC, named Ogopogo. This monster is said, at least what I have heard when I was up there, to be Nessie when she travels away from Scotland in the winter months and comes to reside in BC. Now, I do not understand how this works since the monster is travelling from lake to lake but maybe there is some secret passageway that connects the lakes that Nessie/Ogopogo travel to get to Scotland and Canada. There is another lake monster in Canada, closely tied to Ogopogo, named Igopogo. This monster resides in Ontario at Lake Simcoe and is obviously very closely related to Ogopogo enough that it may again even be the same monster. I want to write a paper about Nessie, but then tie in other lake monsters from Canada since people there believe they are the same monster. So, I'm trying to pick one that will be interesting, challenging and unique (as in a cryptid not everyone else will pick as well). 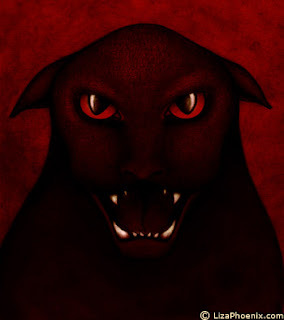 I've always been interested in stories about the Chupacabras - legendary creatures reported to roam Central and South America that have a habit of attacking livestock (particularly goats) and drinking their blood. The name Chupacabra actually translates to "goat sucker" in English. Last year, animal control officials in Texas reportedly shot and killed an odd looking dog creature that many thought could be one of the legendary creatures. The officials said it appeared to be some sort of dog/coyote hybrid with some type of mutation or viral infection. There's a lot of information and stories of Chupacabra encounters going back over the past century, it looks like. legendary Thunderbirds - ma ssive, possibly prehistoric birds, that apparently are still spotted every once in a while. Washington state seems to be a hot spot for sightings, as well as Alaska. Many native peoples have legends and myths centered around Thunderbirds. 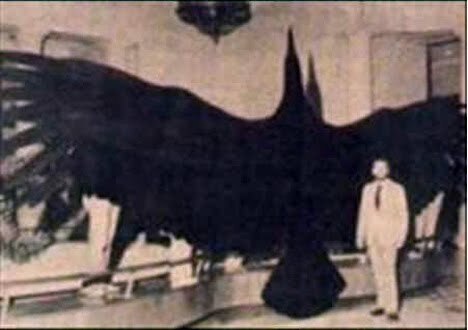 This is a really old but famous Thunderbird photo. Although, I think its validity is certainly questionable. Lots of good choices. I would encourage everyone to really hunt around. I think the two weeks worth of presentations will be way more interesting if not everyone talks about Bigfoot or Nessie.